EMIR (Especrografo Multiobjeto Infra-Rojo) is the first second-generation GTC instrument to enter regular operations. 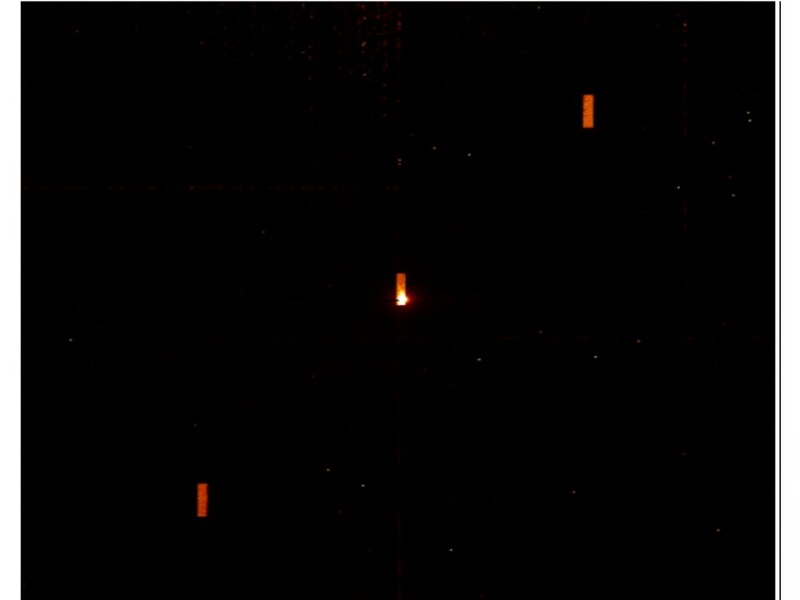 It is a near-infrared (0.9 - 2.5 µm) wide-field imager and medium-resolution multi-object spectrograph installed at the Naysmith-A focal station. 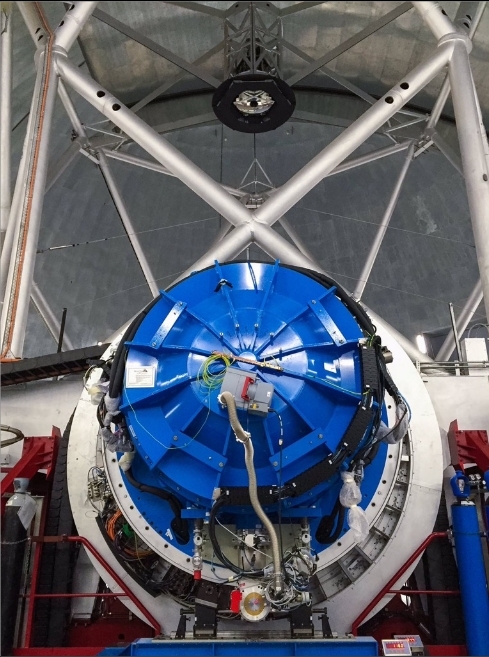 The center piece of the instrument is the CSU (Configurable Slit Unit) allowing to configure and observe in real time up to 55 slits over the 4' x 6.67' spectroscopic field of view. Long slits with different dimensions could be configured as well. The disperser elements are formed by combining high-quality diffraction gratings, manufactured by photo-resistive procedures with large conventional prisms. In imaging mode the 6.67' x 6.67' field of view could be observed through 11 narrow and broad-band filters (including the standard 2MASS JHKs). The detector is a 2048 x 2048 Teledyne HAWAII-2 HgCdTe near-infrared optimized chip with a pixel scale in imaging mode 0.2"/pixel. The EMIR project led by the IAC with the participation of the Laboratoire d'Astrophysique - Observatoire Midi-Pyrenees (France), Universidad Complutense de Madrid and the Laboratoire d'Astrophysique - Observatoire de Marselle (France). The most important features and characeristics of EMIR are summarized below, followed by a representation of the instruments optics and a picture showing it attached to Naysmith A focal station of the GTC. EMIR attached to the Nasmyth A focal station of the GTC telescope. EMIR is equipped with a HAWAII-2 IR detector manufactured by Teledyne. 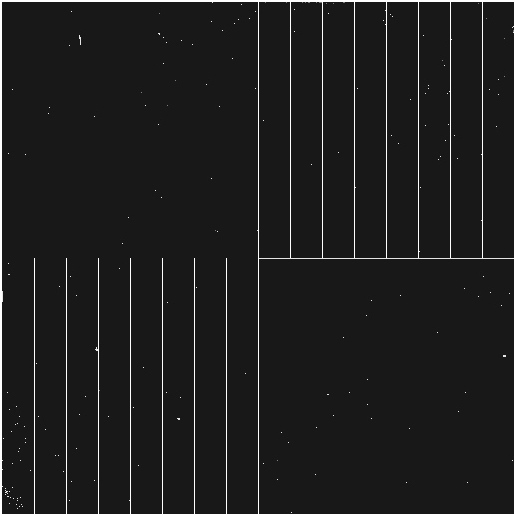 It is a HgCdTe array of 2048 x 2048 pixels (18 μm square each), operating between 0.9 and 2.5 μm and optimized for the K band athmospheric transmission window (~ 2.1 μm) at cryogenic temperatures. The detector is divided into 4 quadrants (1024 x 1024 pixels each). Individual quadrants are read out through 8 channels, permitting a full frame rate of slightly over one frame per second. The read out of the 32 channels is performed simultaneously. 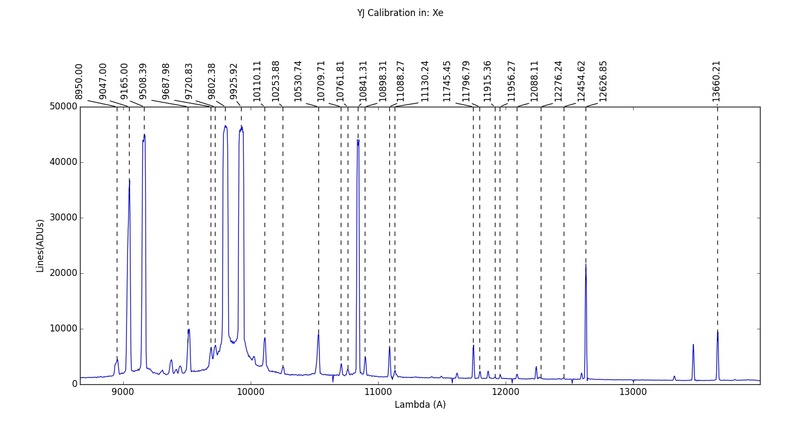 The following table summarize some detector parameters of interest. Dark Current < 0.15 e-/sec. Below you could see an example of the detector Bad Pixel Mask (BPM) as of 14.11.2016. The current BPM can be downloaded from here. 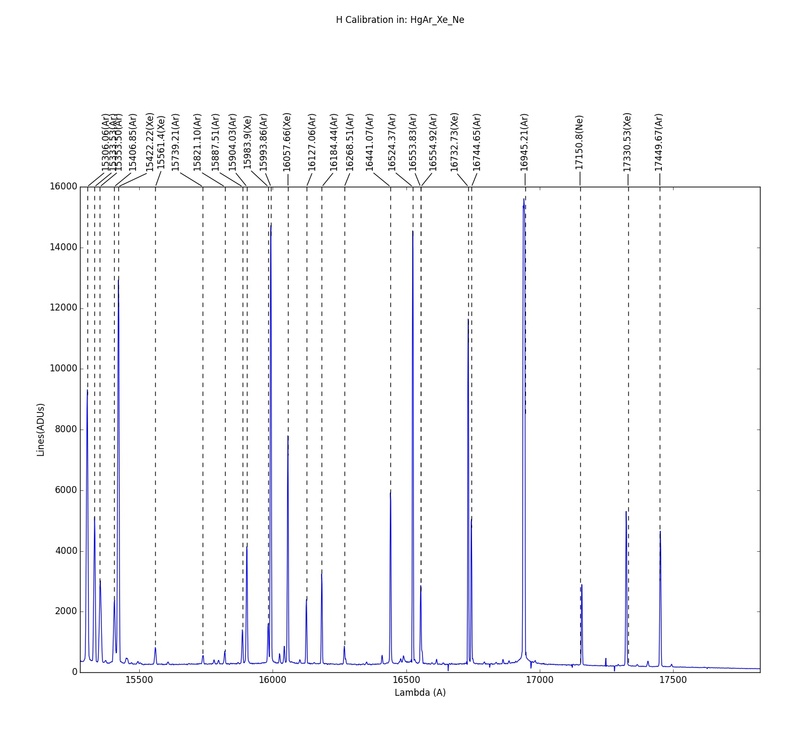 Note that this is the BPM utilized by the instrument Data Reduction Pipeline (DRP). Example of the BPM for the instrument. 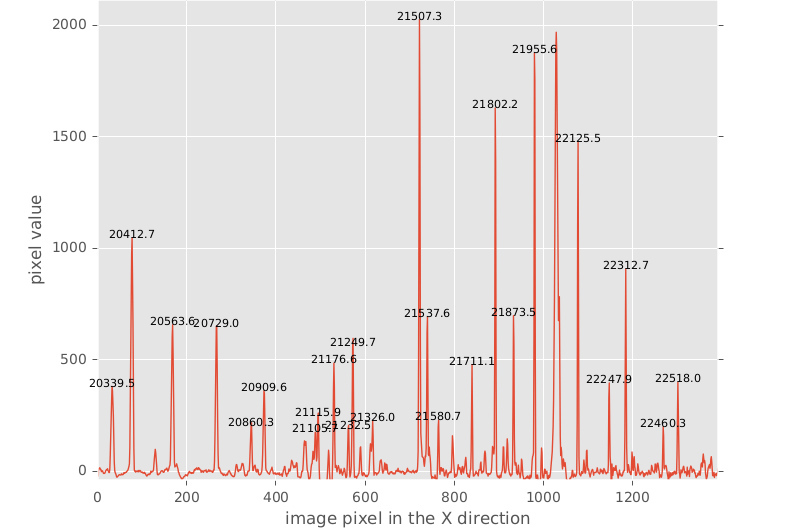 Dark areas (zeros) represent the good pixels, while the light regions (positive values) indicate the known bad pixels. Keep in mind that the features will be evolving with time as detector properties are changing. Due to the calibration specifics of the detector, keep into account that only a pre-defined set of quantified exposure times is available. 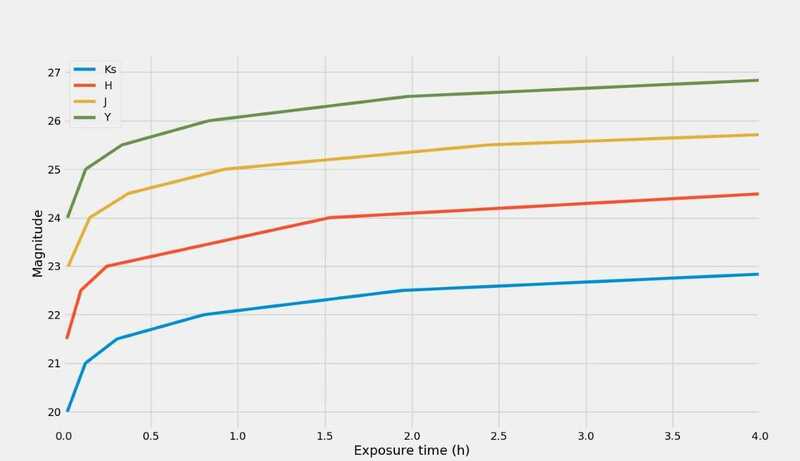 The exposure times are summarized in the table below, along with the corresponding readout modes. During the initial EMIR commissioning run, in 2017, it was found that the detector was significantly tilted with respect to the focal plane. 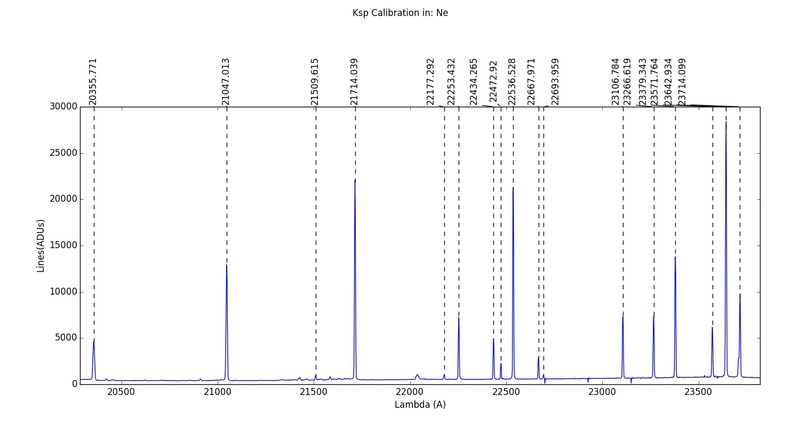 This lead to a noticeable change in image quality across the detector as can be seen in the upper plots of next Figure. During an intervention in 2018 the tilt was reduced by a factor or 3 to 4 (middle row of next Figure) and currently in 0.8 arcsec seeing the increase in FWHM is at most 20% at the edge of the field. 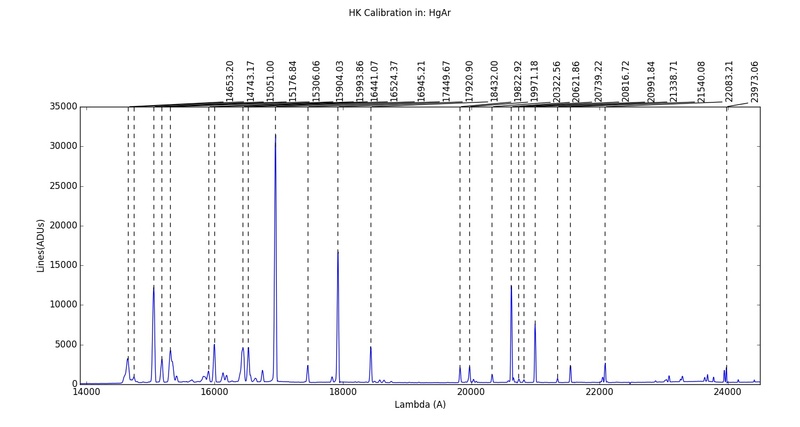 An alternative representation is given in the lower plot where the colour and circle size indicates the measured FWHM for each source in a star field. Again it is clear that there is only a slight loss of image quality in the corners of the field. Effect in the IQ along EMIR FOV due to the detector tilt. After the intervention in 2018 (middle and lower panels), this tilt was noticeably reduced with respect to the initial one (upper panel), affecting slightly the IQ at the corners of the FOV. Representation of the EMIR Field of View (FOV). The image in the background is a J band image of NGC6946 spiral galaxy, acquired during the instrument tests at GTC. The imaging mode FOV covers the entire extent of the detector (2048 x 2048 pixels / 6.67 x 6.67 arcmin). 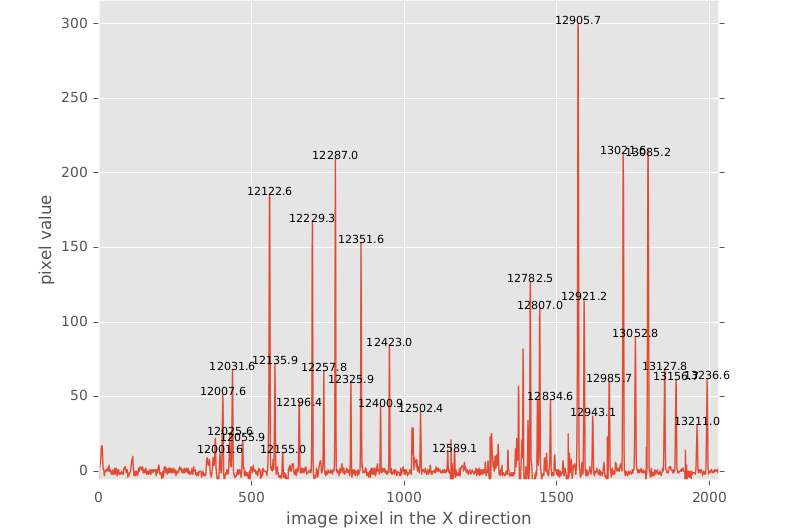 The Multi-Object Spectroscopy (MOS) FOV is the central (1234 x 2048 / 4.0 x 6.67 arcmin) or the grayscale represented part of the image with X coordinates roughly in the range from 410 to 1640. The three distinct pre-defined Long-Slit (LS) positions currently in use are outlined in red, green and cyan for the right, central and left slits respectively. The two LS positions at the borders of the Cold Slit Unit (CSU) range are represented in grey. 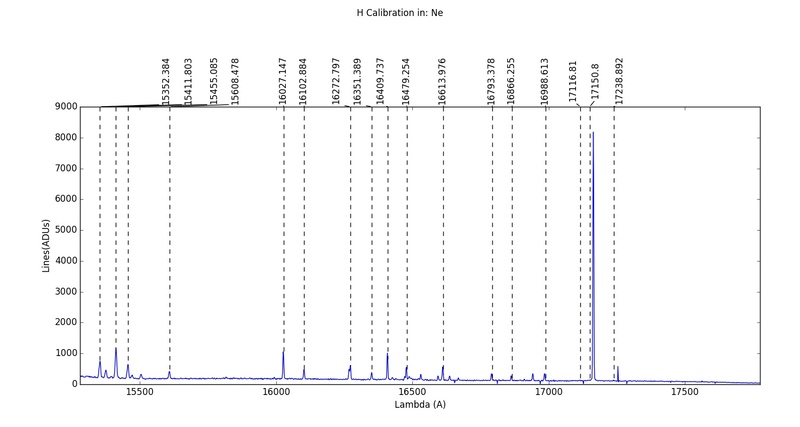 Note that the color coding of the slits matches the one used in the wavelenth calibration section of this page. For more details - see the sections dedicated to each observing mode. EMIR allows broad-band imaging over a 6.67' x 6.67' FOV, covering the atmospheric transmission windows in the 0.9 - 2.5 μm spectral range, utilizing the Y (1.03 μm), standard J (1.25 μm), H (1.63 μm), Ks (2.16 μm) 2MASS filters and Johnson K (2.23 μm) filter. 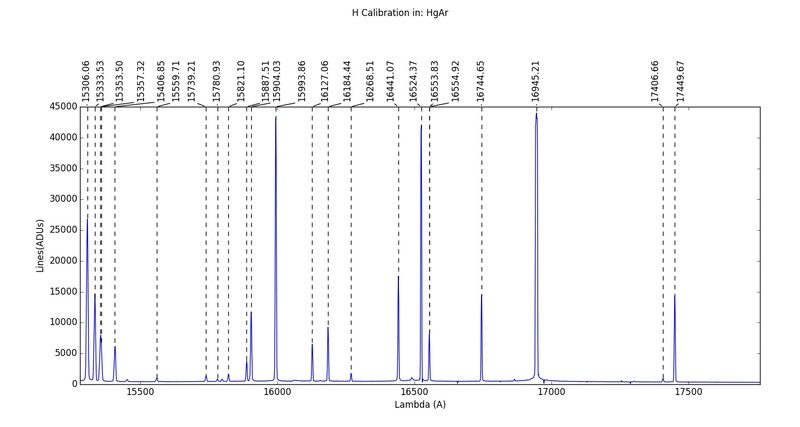 Note that due to the tilt of the detector with respect of the focal plane, the Image Quality (IQ) varies across the imaging FOV. 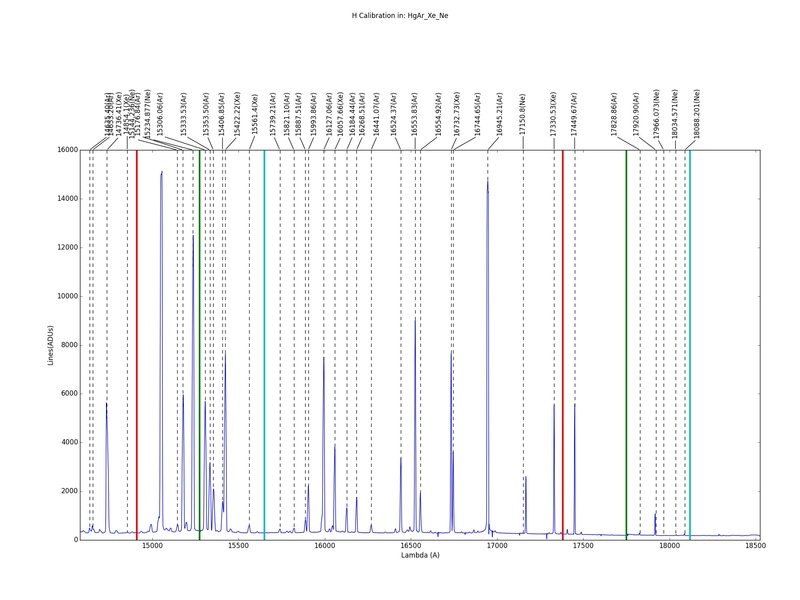 The best results, uniform PSF and IQ are achieved in the central 5.5' x 5.5' portion of the field. 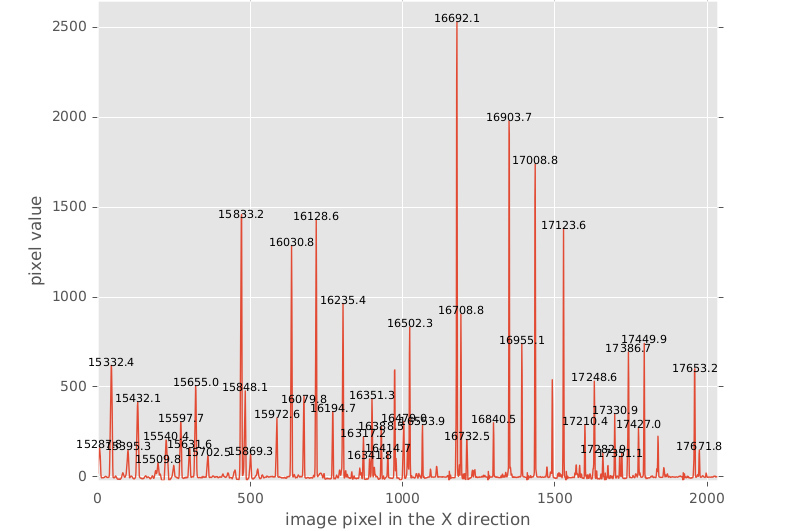 The plate scale in imaging mode is 0.1945 arcseconds/pixel. 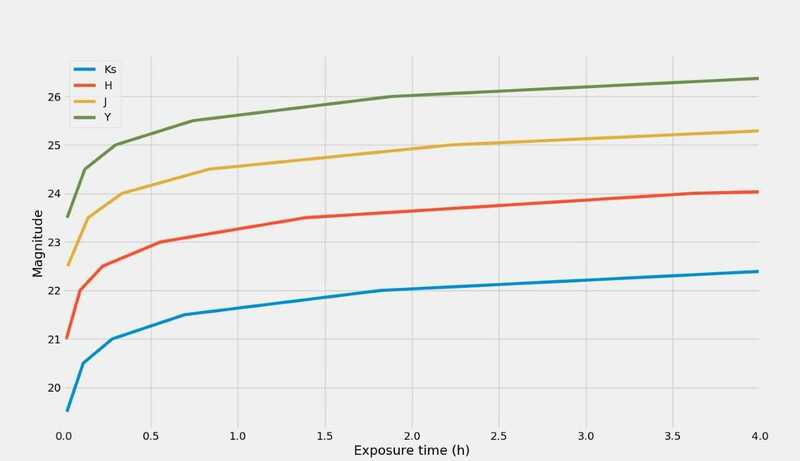 Transmission curves for the broad and narrow-band imaging filters currently installed in EMIR. 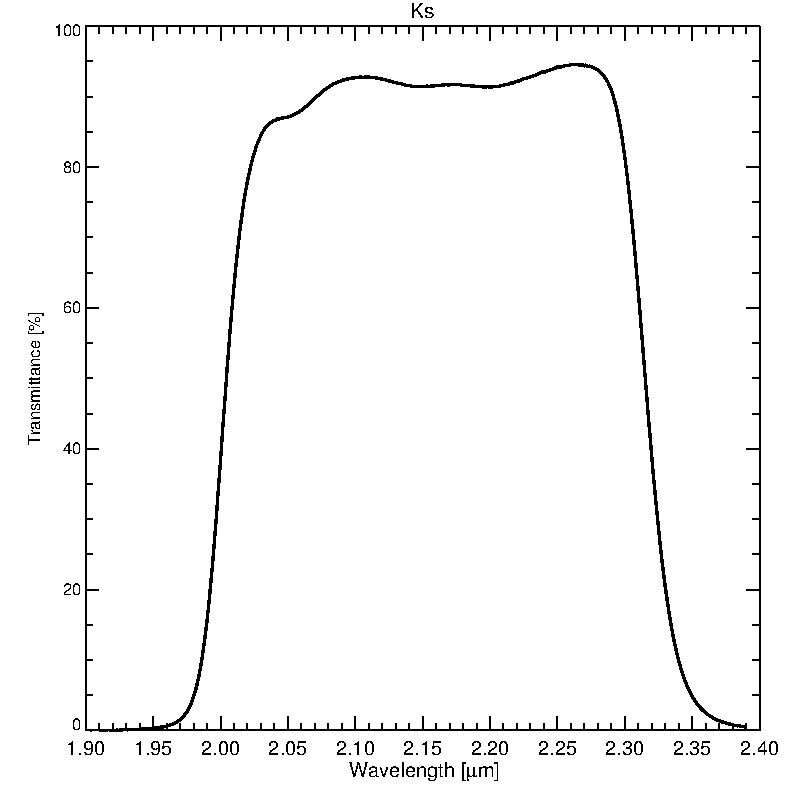 The atmospheric transmission between 0.9 and 2.5 μm is superimposed as a grey line. 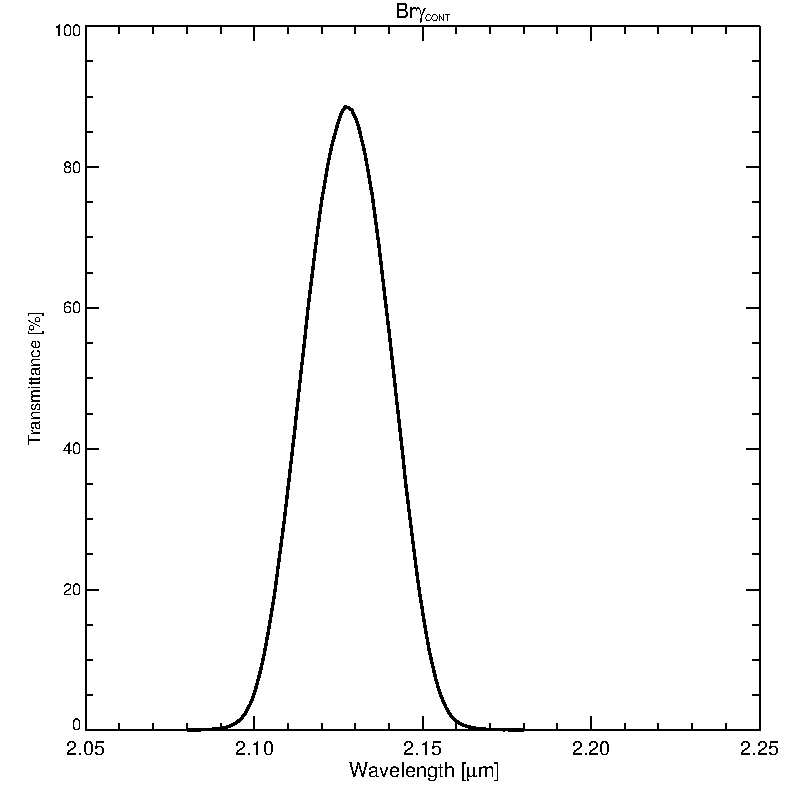 To avoid clutter, the H2(1-0) filter is not shown on this figure since its transmission curve almost fully coincides with the transmission of the BrγC filter. The broad-band photometric zero-points for EMIR are presented in the following table, as well as estimates of the limiting magnitudes, sky brightness and the times to saturate the sky in the most utilized near-IR broad- band filters. 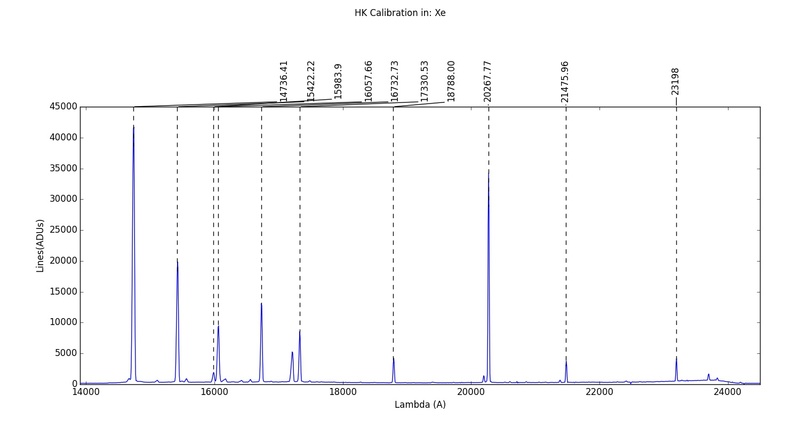 Note that the Zero Points (ZP) are given in the Vega system and the limiting magnitudes are for 3σ detection in 1 hour exposure time with 0.6 arcsec seeing. The following plots show the limiting magnitudes in the four broad band filters of EMIR for getting S/N=3 as a function of the exposure time for a point-source in 0.6 arcsec seeing (above) or in 0.9 arcsec seeing (below), both at airmass =1.2 (note these use the ETC predictions for aperture of 1.2*FWHM_seeing). Limiting magnitudes achievable in EMIR Imaging mode as a function of time. 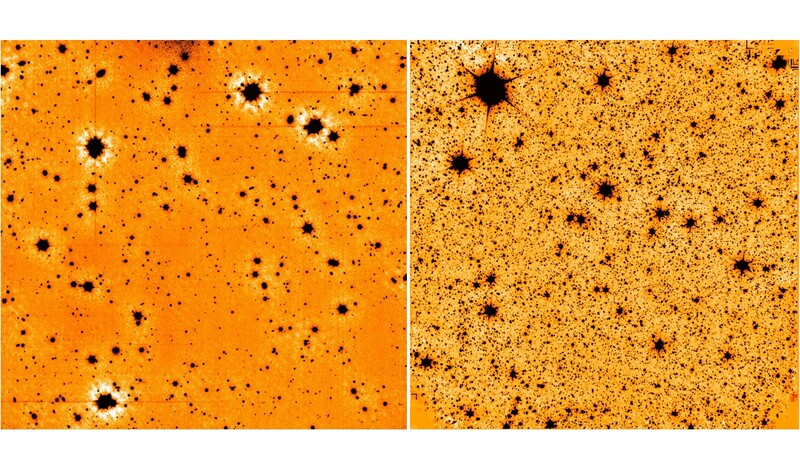 Example of deep integration images taken with EMIR in J(left) and Ks (right), getting Ks=22.5 in 2.5 h of on-source time (in agreement with ETC predictions). Medium-band filters for EMIR (resolution 30-40) are available (see details in the table below). These were purchased by Dr. Pablo Pérez González from the Universidad Complutense de Madrid and Dr. José Miguel Rodríguez Espinosa from Instituto de Astrofísica de Canarias. 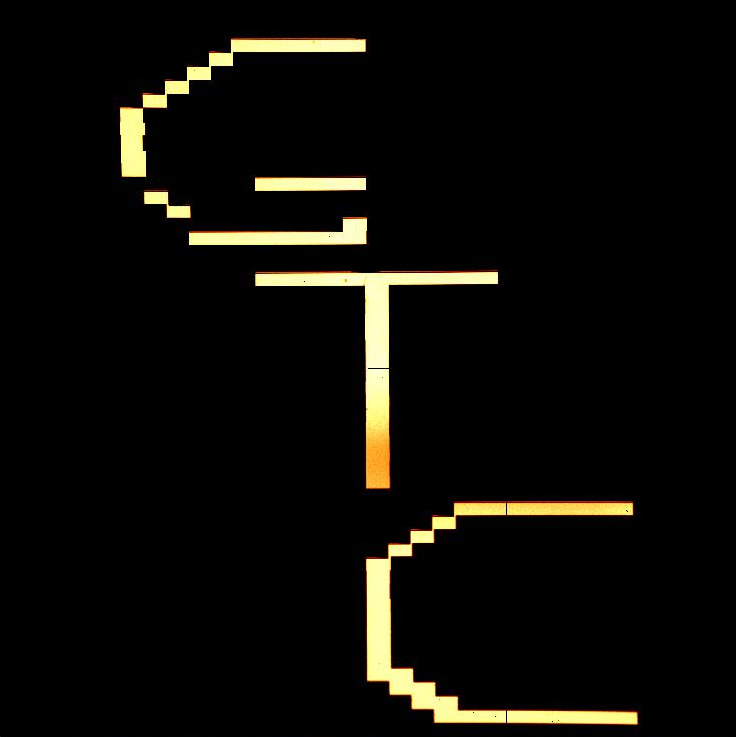 These filters have been offered for general use to the whole GTC community. The FOV and pixel scale for the narrow-band imaging mode are the same as for the broad-band mode. Note that due to the tilt of the detector with respect of the focal plane, the best results, uniform PSF and IQ as well are achieved in the central 5.5' x 5.5' portion of the field. The filter currently installed in the instrument is highlighted in blue. Keep in mind that replacing a filter in EMIR requires a thermal cycling of the instrument. We kindly invite people interested in these filters to contact the owners expressing their commitment to include an acknowledgment in any publication arising from their use. 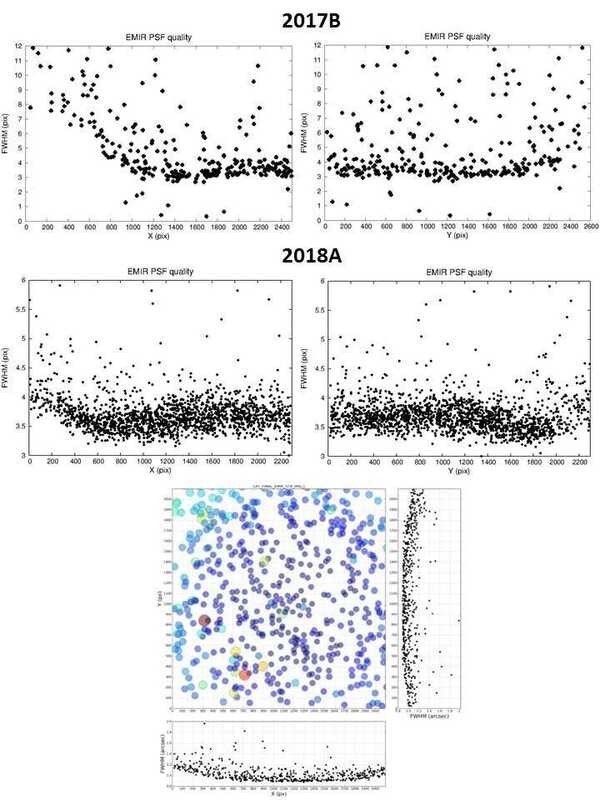 This is the suggested acknowledgment text: "This work is (partly) based on observations carried out with EMIR and medium-band filters purchased with funds from Spanish Government grants AYA2015-63650-P and AYA2015-70498-C2-1-R". In long slit observing mode the Configurable Slit Unit (CSU) is used to form slits with pre-defined dimensions at three distinct positions in the spectroscopic FOV: one at a central position and two at one arcmin to the left/right from the center (that can be used in order to better exploit the wavelength coverage along the FOV). Currently, slit widths of 0.6", 0.8", 1.0", 1.2", 1.6" and 5.0" are available. Technically slits with arbitrary widths and lenghts could be defined within the entire extend of the 4' x 6.67' field. However these should be considered and treated like MOS configuration files. As well as in imaging mode, the tilt of the detector with respect of the focal plane also applies to the spectroscopy mode, producing that the FWHM of the spectral traces are slightly deteriorated towards the left edge of the detector (affecting to bluer wavelengths). Transmission curves for the spectroscopic filters currently installed in EMIR. 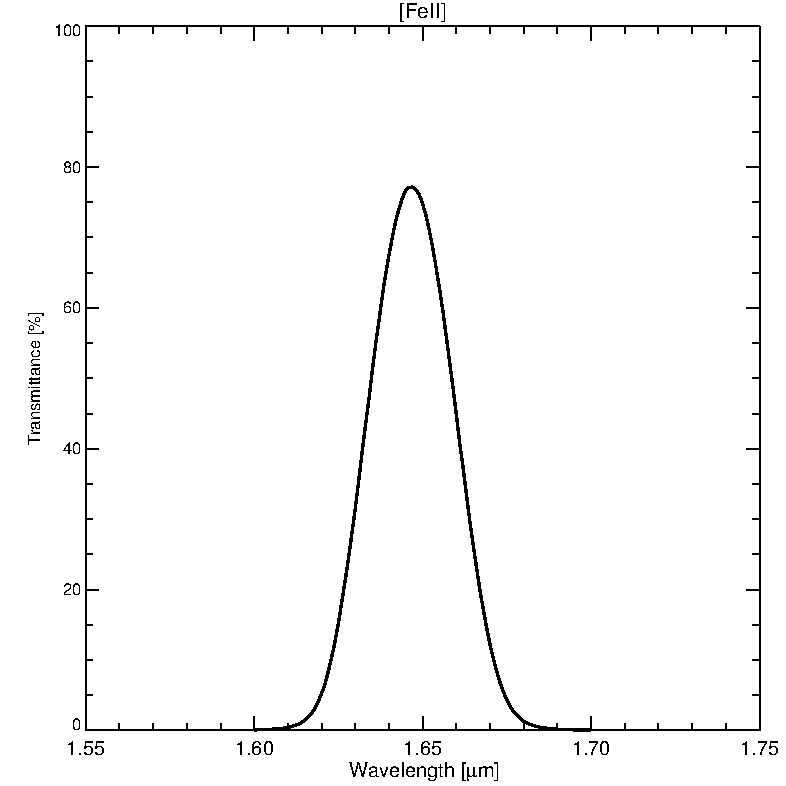 The atmospheric transmission between 0.9 and 2.5 μm is superimposed as a grey line. The properties of the spectroscopic filters installed in EMIR are summarized in the table below. Next table summarizes the main characteristics of EMIR dispersive elements. 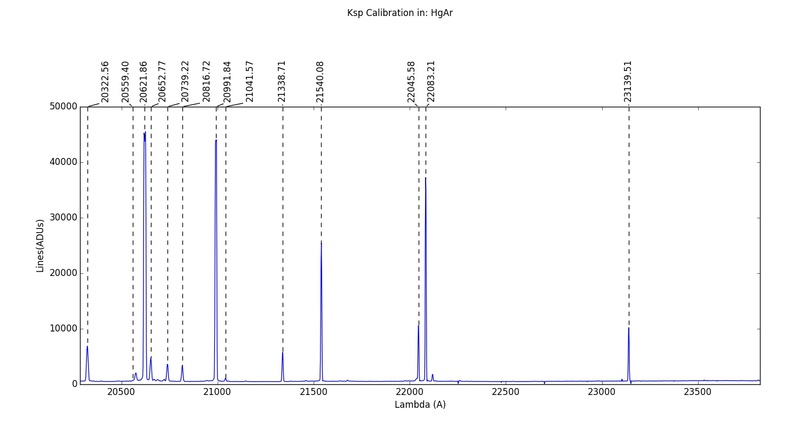 There are three pseudo-grisms which offer high resolution (J, H and K bands) and a low resolution normal grism (LR). 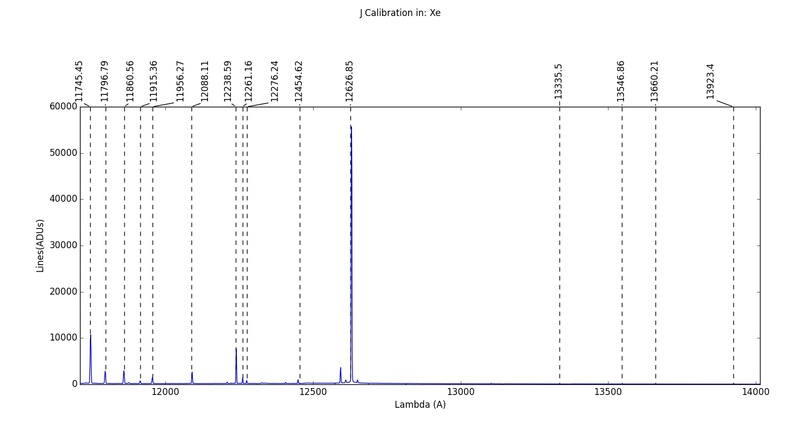 Last column gives the measured value of the central wavelength with the slit in the central position. The table below gives information about the central wavelength and the wavelength range covered (in micrometers [μm]) for the different pre-defined LS positions. Note that the color coding in the table concides with the one of the figure illustrating the EMIR FOV (above) and the one utilized in the wavelength calibration section below. 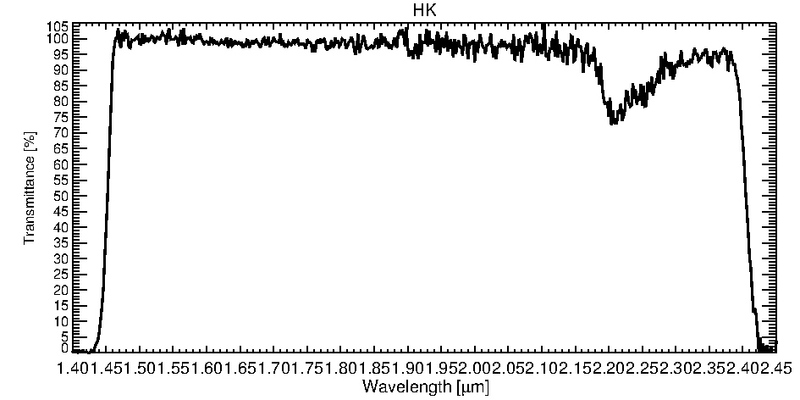 The zero order ghost position is measured for a bright telluric standard star, observed at the nominal position for LS spectroscopy with coordinates [1030,1215]. Ghost A is situated at a distance 60 - 80 arc-seconds from Spectrum A and Ghost B is at 30 - 50 arc-seconds from Spectrum B. !!! Note that if the position (Y coordinate) of the spectrum does change, the ghost appears at other position. Do not place the spectrum at the center of the detector to avoid overlap with the ghost !!! In the table below is summarized the information about the zero order and the corresponding ghost for each filter/grism combination and the relative intensity with respect of the spectrum for both A and B positions and 15 arc-seconds offsets. 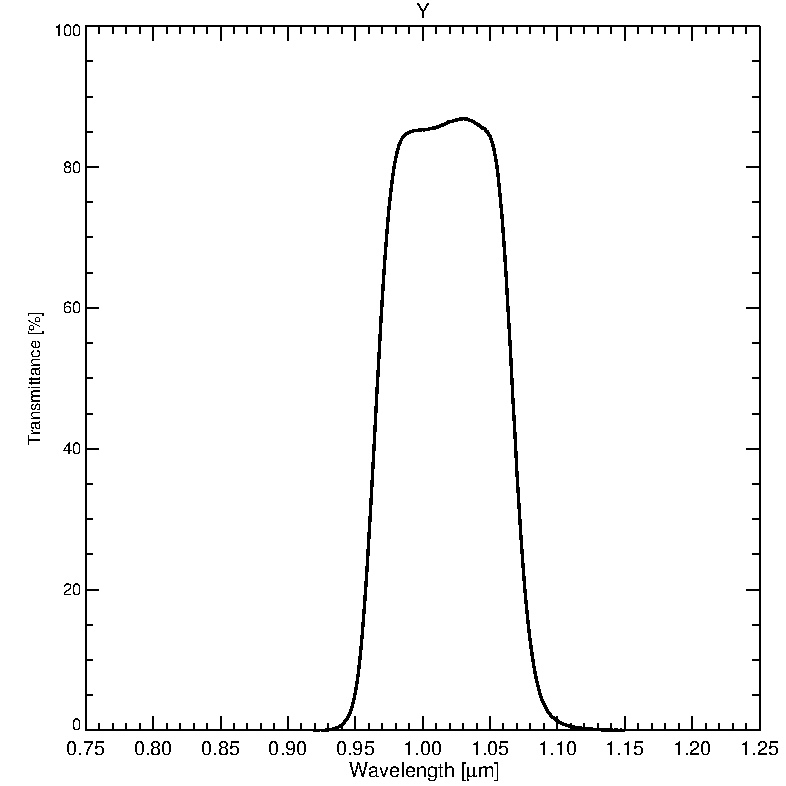 Take into account that this information is valid only for the nominal position for LS spectroscopy. 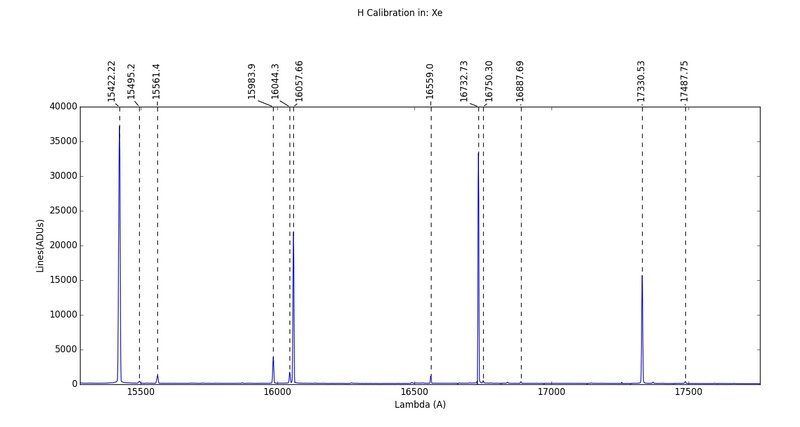 Relative offsets of the spectrum and the zero order ghost for the standard position for LS spectroscopy. 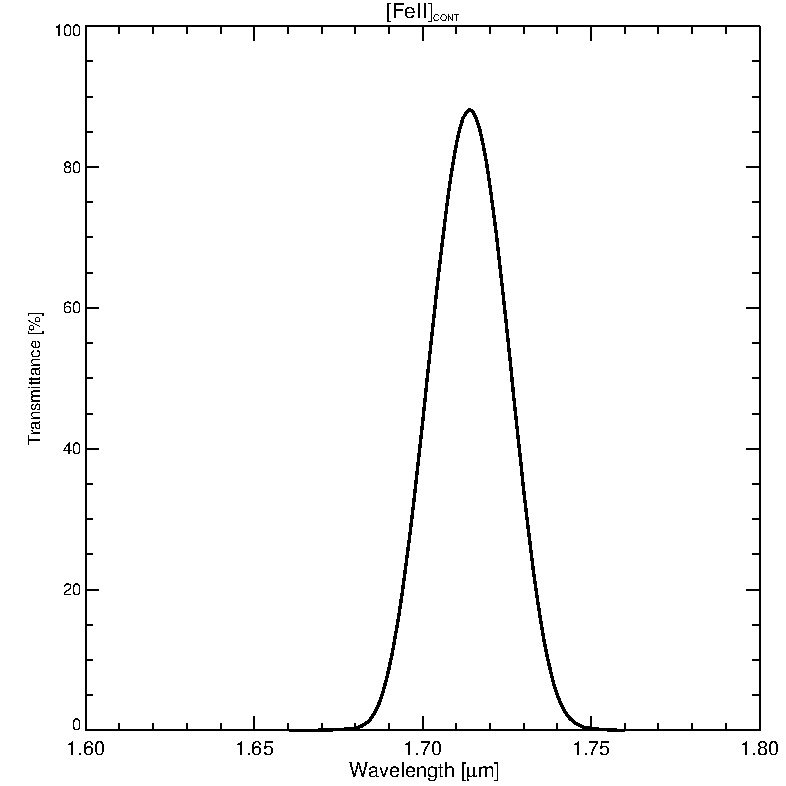 N gives the numerical relation between the positions of the spectrum and the ghost. The equation that predicts where will appear the zero order ghost image on the detector for the J, H and K grisms. (Ghost images are not detected in YJ and HK.) The N value for each grism are tabulated above. 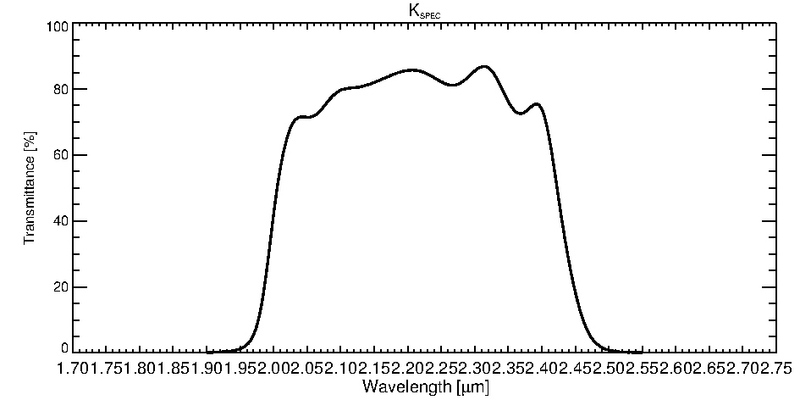 The relative spectrum-ghost positions for both nods (A-B) for the J, H and K grisms (respectively from left to righ and top to bottom) for an offset of 15 arc-second. 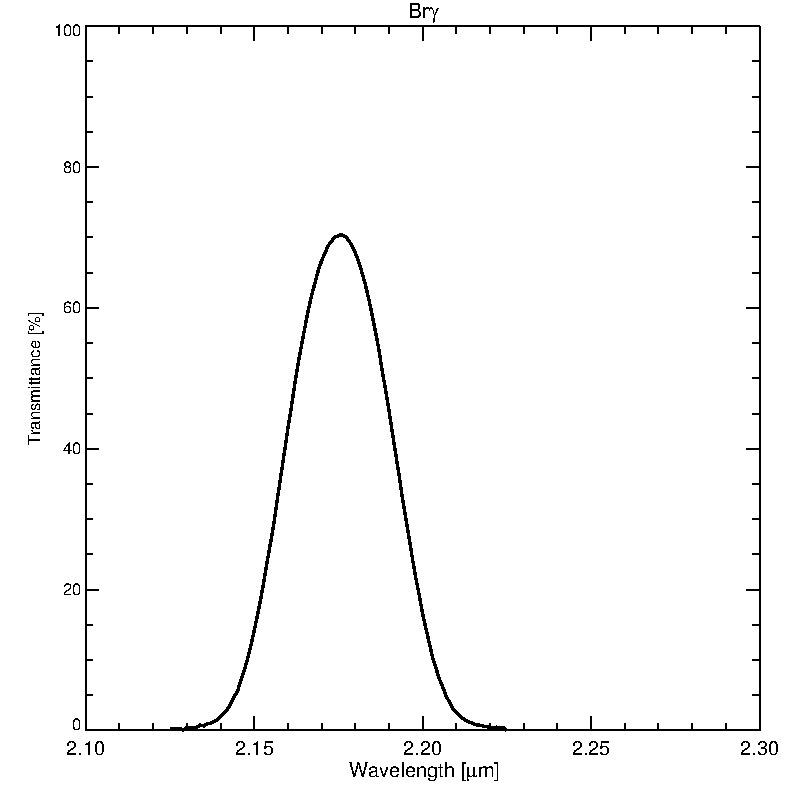 It is notable that the distance spectrum-ghost is not the same for A and B positions. 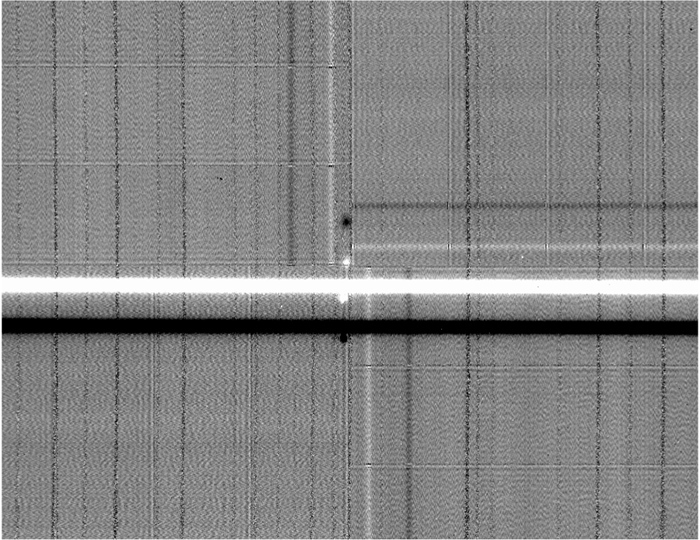 On this image it is clearly visible that if the spectrum is acquired closer to the center of the detector, the ghost position approaches to the spectrum. 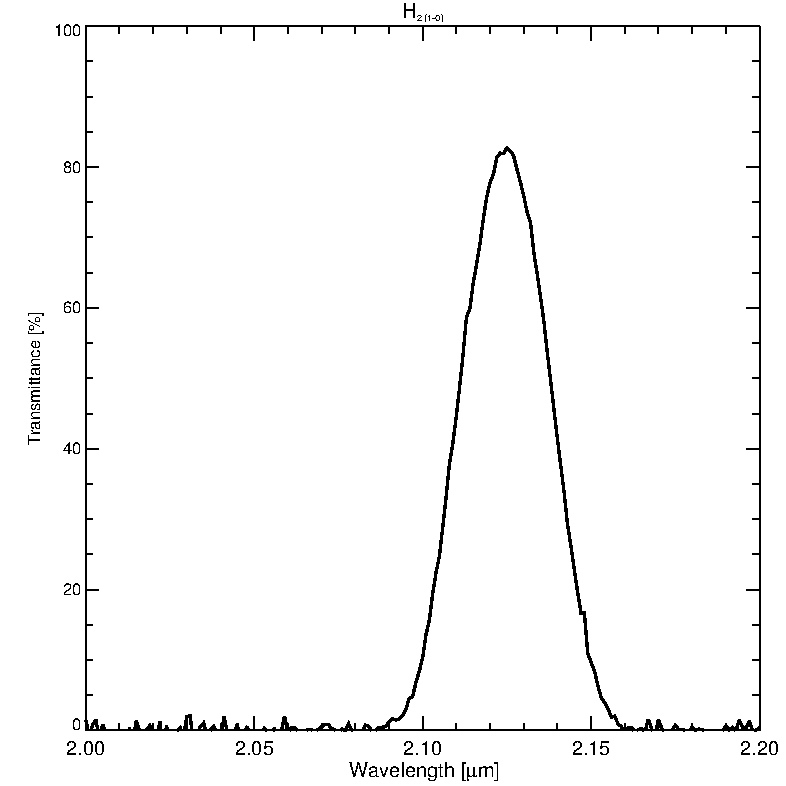 EMIR allows Multi-Object Spectroscopy (MOS) over a 4' x 6.67' FOV, covering the 0.9 - 2.5 μm spectral range, utilizing three spectroscopic filters, which properties are summarized in the table presented in the long-slit spectroscopy section. 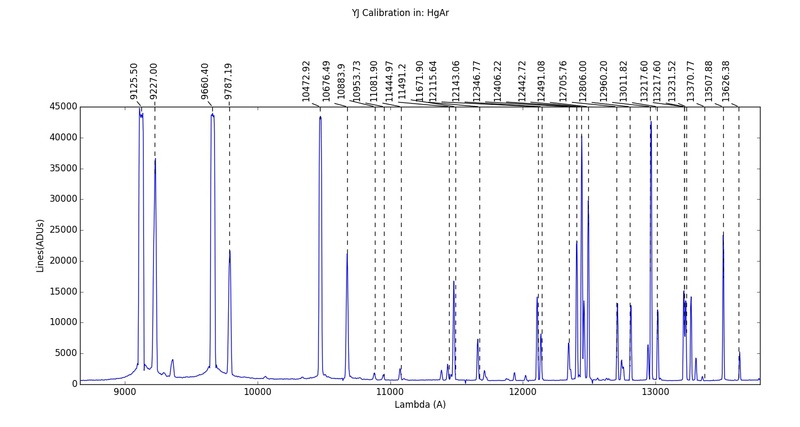 The properties of the grisms mounted in the instrument are also summarized there. Up to 55 individual slits could be configured over the FOV, utilizing the instrument´s Configurable Slit Unit (CSU). The following images illustrate the capabilities of the CSU. 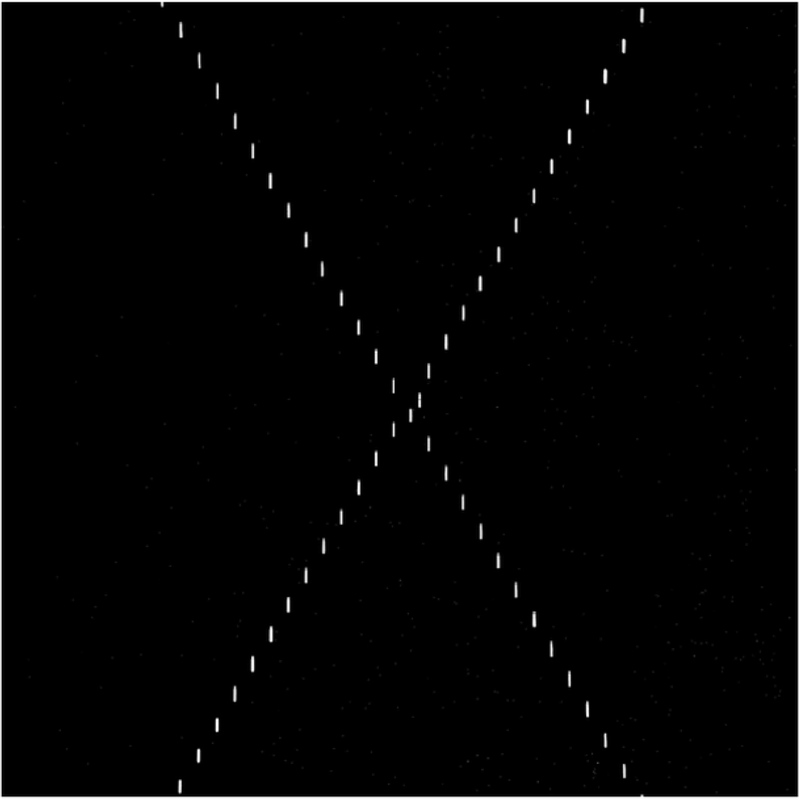 Left: X-shaped configuration of all the slits, outlining the extent of the MOS FOV of the Configurable Slit Unit. Right: GTC logo formed by configuring the slit unit. The configuration of the CSU for a particular field is calculated and prepared by a dedicated software tool, EMIR Optimized Slits Positioner (OSP), detailed description on it use can be found here. 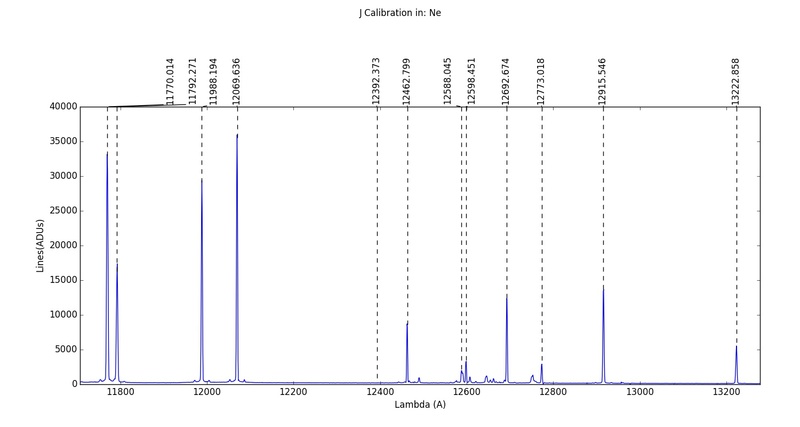 While conceptually equivalent to Long Slit Spectroscopy once the CSU is configured and the objects have been acquired, the initial step of the MOS mode has sufficient number of specificities so as this section is entirely devoted to it. 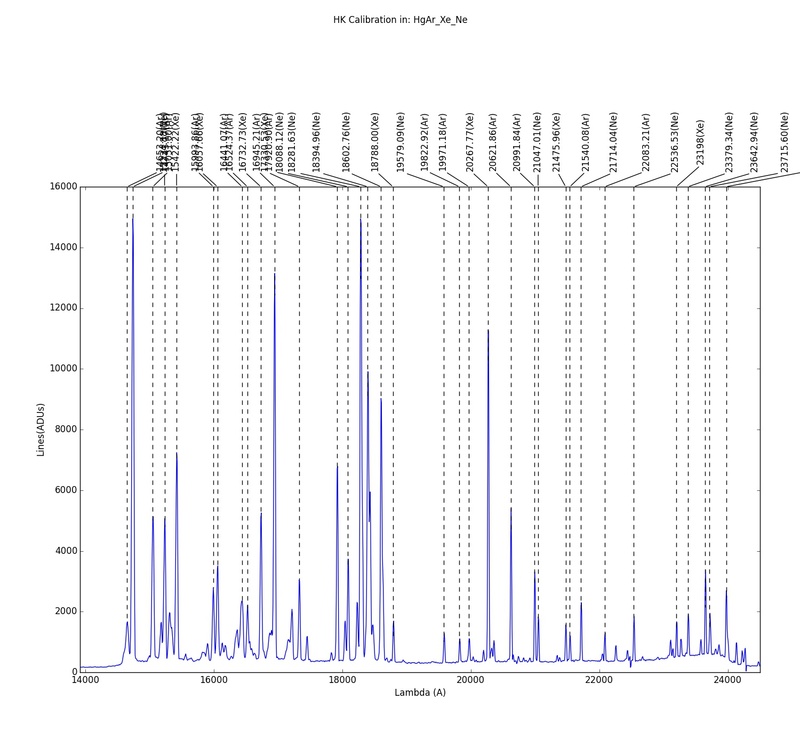 Once the CSU configuration file is obtained using the OSP tool, the instrument setup already done and the field acquired, the observation can proceed as in the Long Slit Spectroscopy. Good astrometry is essential. Bear in mind that MOS can accommodate a large number of objects, in theory up to 53, distributed over the spectroscopic FOV. The width of the slit assigned to each object would be typically around 1 arcsec o even less. Hence, absolute astrometric accuracy at the level of 0.1 arcsec or better is highly advisable. With the release of the Gaia results, that should not be a problem. Anyhow, it is totally up to the user the configuration of the EMIR CSU around the target list. The length of slit assigned to each object must be sufficient to allow for beam switch along the slit (ABBA pattern), if this is selected. 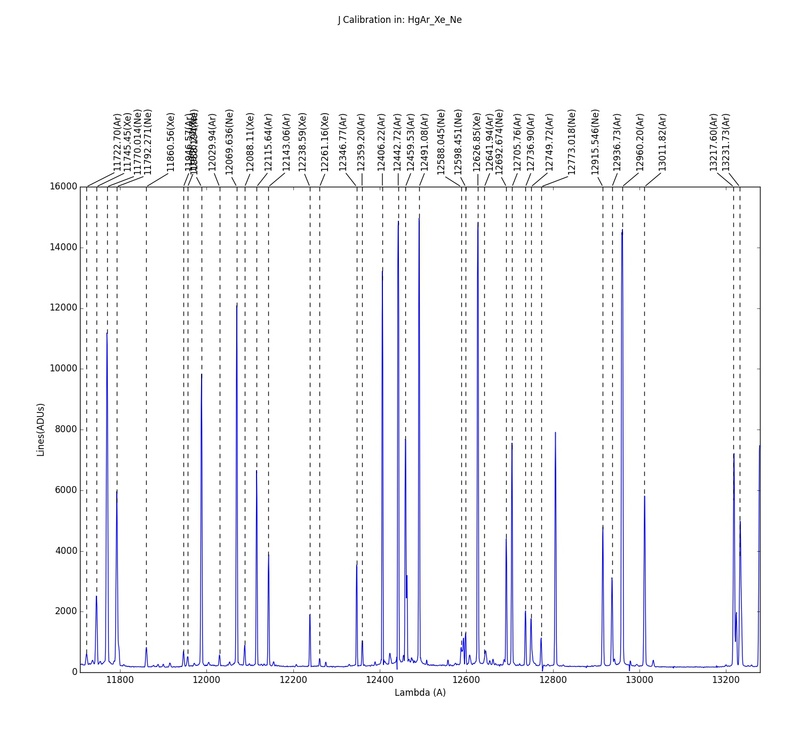 To this end, more than one slitlet, each one of ~7.2 arcsecs in height, can be allocated to a single object. Also, for the success of the ABBA pattern, the location of each object on its slit must be commensurate with the selected nodding throw and the direction of the initial displacement. The central wavelength of each spectrum is placed at the location of the optical image of the corresponding slit on the detector. Hence, the spectral range covered by each of them will vary accordingly. Due to the optical distortion, the slits at both ends, numbers 1 and 55, are not fully imaged onto the detector. Hence, they cannot be used as primary slits to allocate objects but are useful to complement adjacent slits. The OSP tool has been designed to cope with most of the chorus associated with the CSU configuration. The use of OSP tool is mandatory to produce the configuration files. Once the user has produced CSU configuration files for each of the fields to be observed. 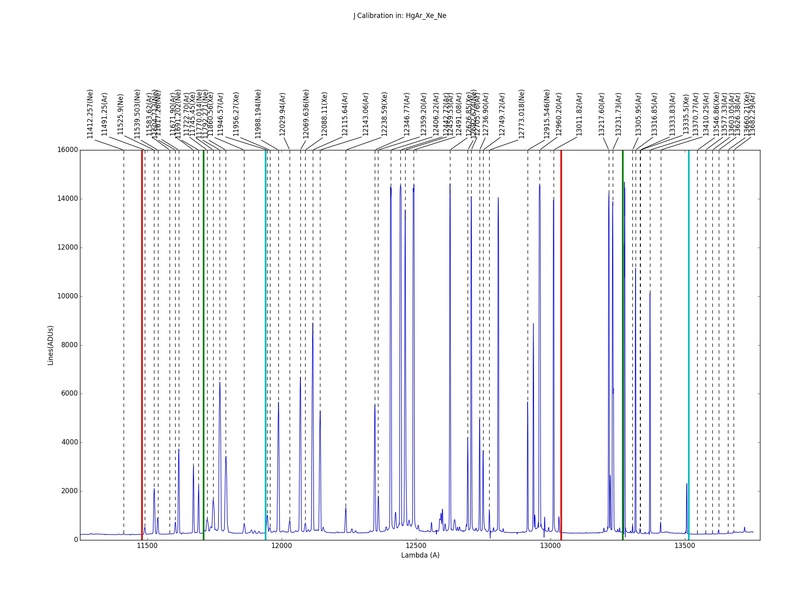 The only file that is strictly needed to configure the CSU is the corresponding CSU output from the OSP. The XML file(s) must be kept with the user for future use and/or additional verifications. They need to be conspicuous, easily detectable in short integration times. That means, among other things, no to be located in crowded areas with objects around with similar brightness. The location of the reference objects in the slits should be as centred as possible, or at least not close to the ends of the slit. This is to maximize the probability of the object to lie within the slit in the first GTC pointing, which might be a bit out of position. Prepare just one CSU configuration file in which the reference slits are open to 5 arcsecs and the target slits opened to the selected width for scientific observations. 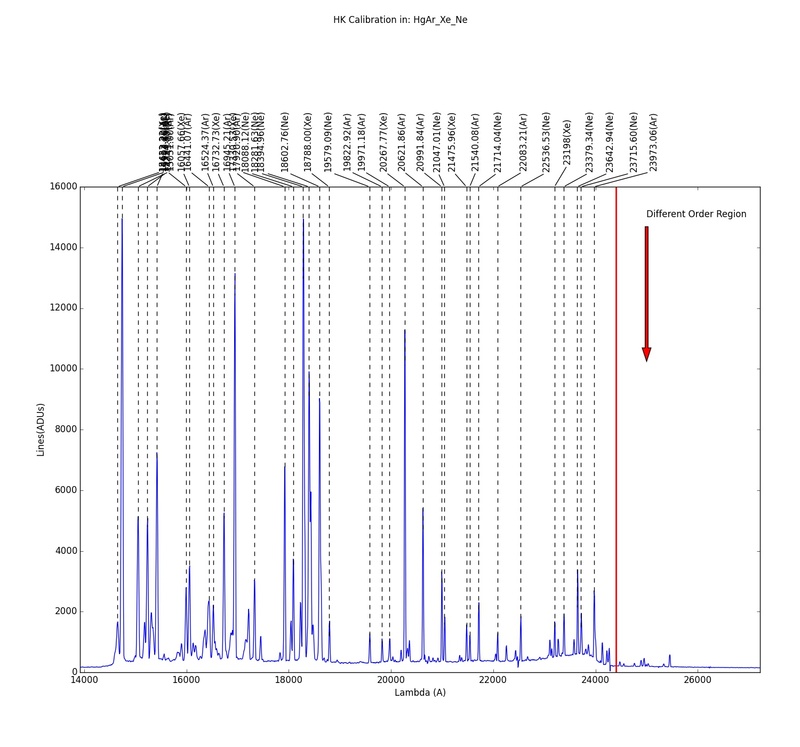 This has the caveat that the reference (bright) objects might contaminate the areas of the target spectra in the detector. 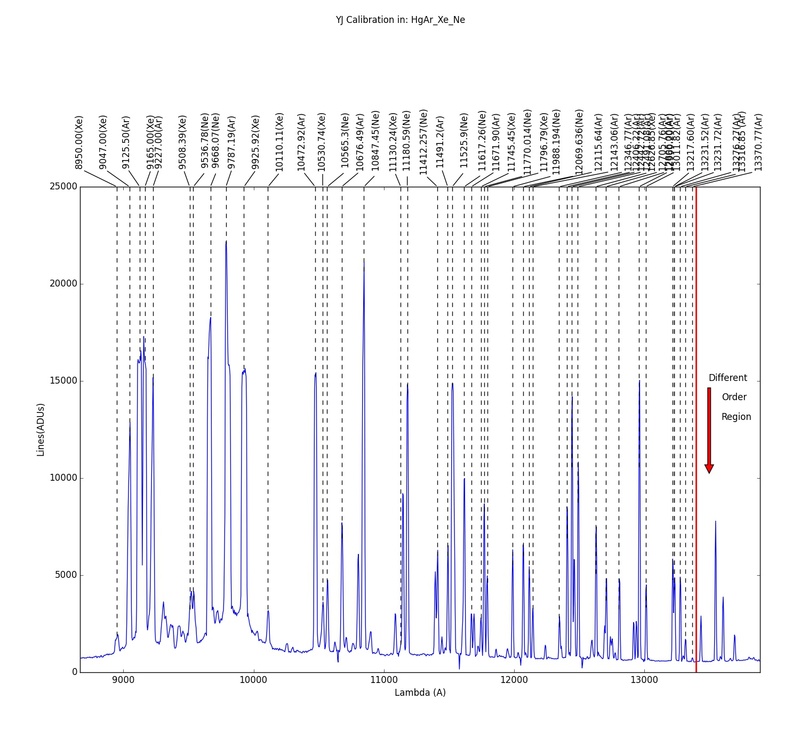 Have two different CSU configuration files, the first of which with the reference slits opened to 5 arcsecs, and the second one with the reference slits closed or opened to a selected width for the scientific observations. The target slits are opened to the selected width in both files. The user has to provide the two configuration files (.CSU) and the .XML to the GTC staff when using GTC Phase 2 Tool. Additionally, the .CONF file produced by the OSP can be also uploaded to include extra information to be incorporated to the image keywords, although this file is not mandatory. EMIR is used in conjunction with the Naysmith A ICM (Instrument Calibration Module), which contains three dedicated Argon (Ar), Neon (Ne) and Xenon (Xe) arc lamps. 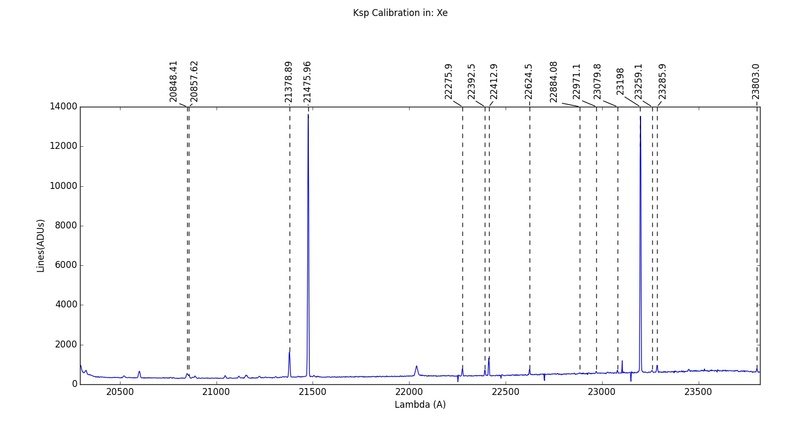 The properties of the calibration lamps are summarized below. Also, a complete arc linelist for all the lamps available at the EMIR Instrument Calibration Module (ICM) can be retrieved here. The images cover the entire spectral range that could be observed with EMIR with different slit positions. 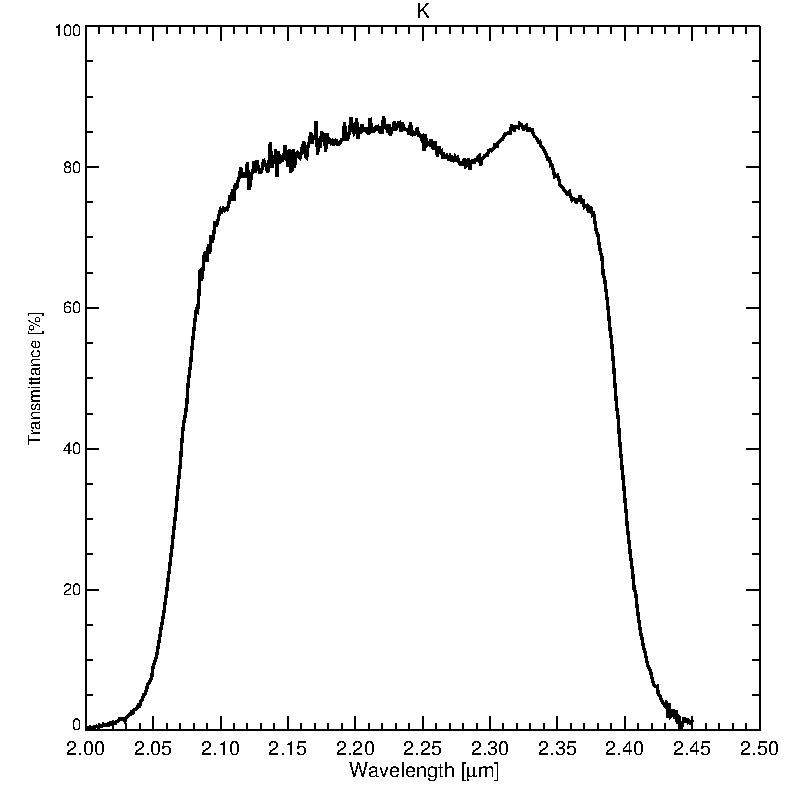 The data below was acquired with the 0.6 arcseconds long-slit CSU configuration and is representable for the middle line of the detector. 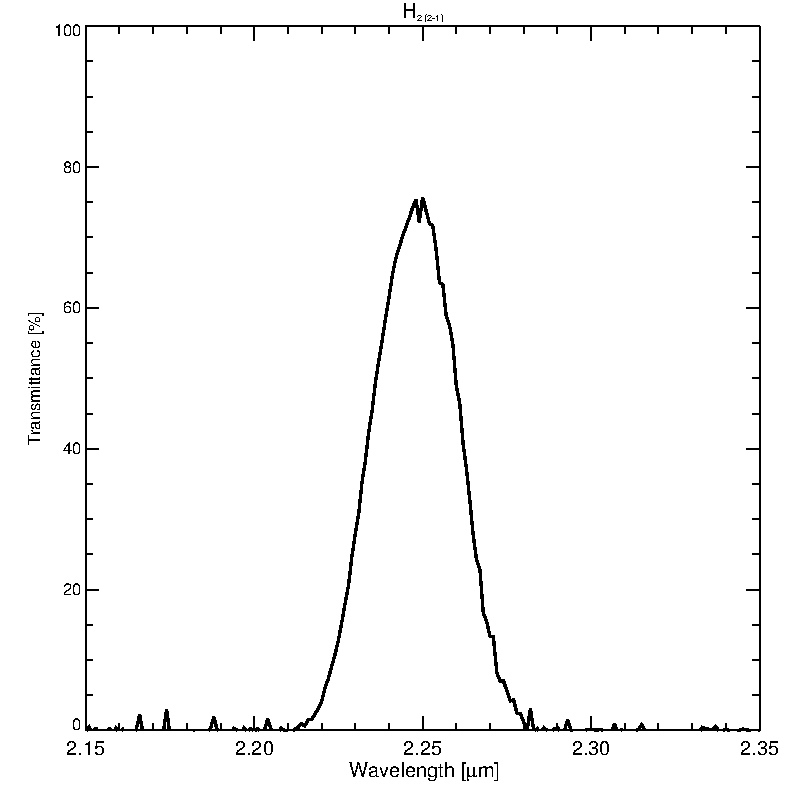 Also, for the low resolution grisms some second order lines are visible in the spectra. Users must be aware of this, in order to avoid these in the line identification. 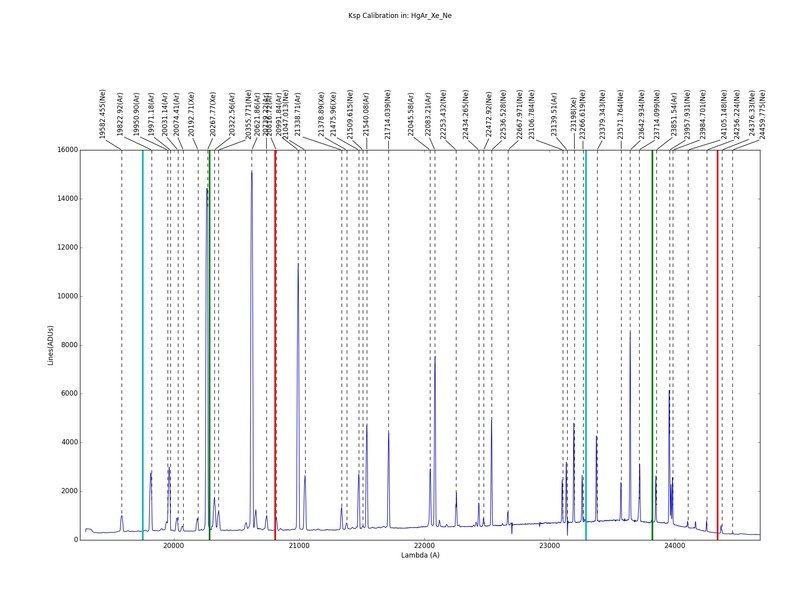 In the last column (outlined in red) are presented the line calibration identification images for the three distinct pre-defined Long-Slit (LS) positions currently in use. The corresponding spectral ranges are presented in red, green and cyan for the right, central and left slits respectively. 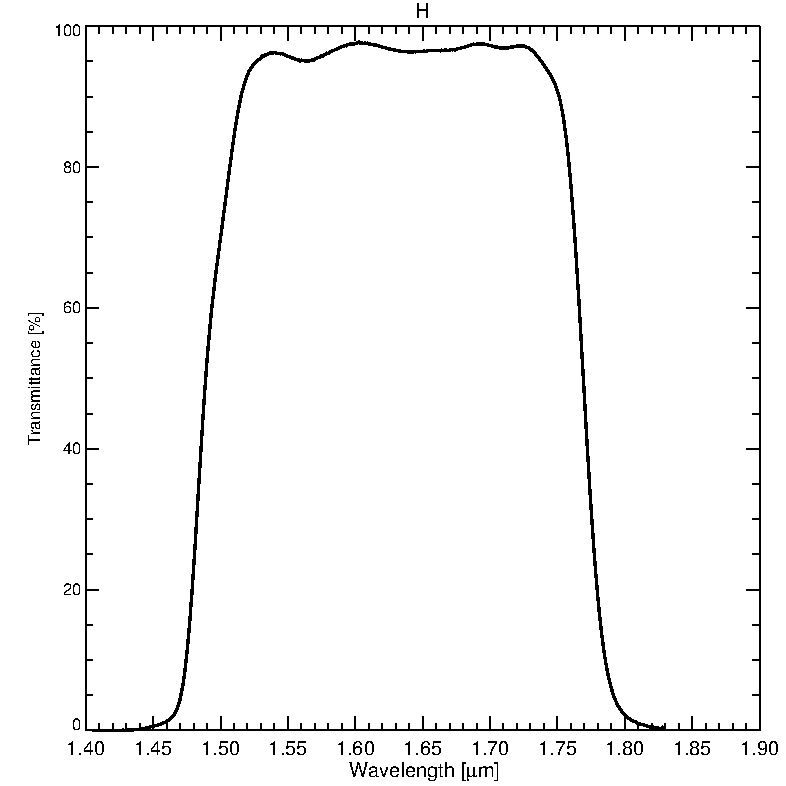 For more detaisl see the Long Slit Spectroscopy section above and the figure illustrating the EMIR FOV. 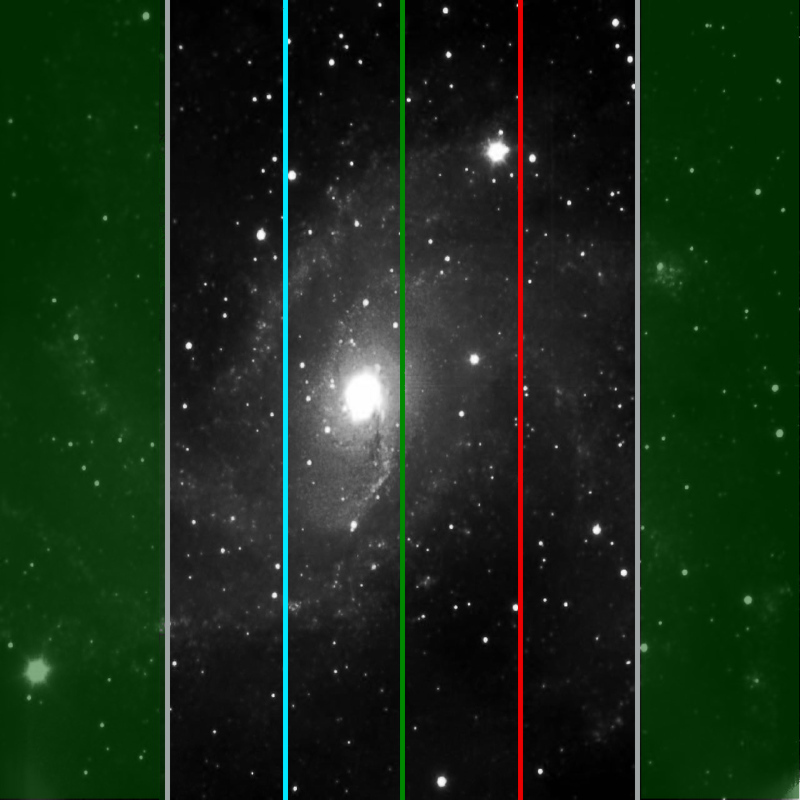 Another possibility widely used in the Near-IR spectroscopy is to utilize the OH atmospheric airglow lines. 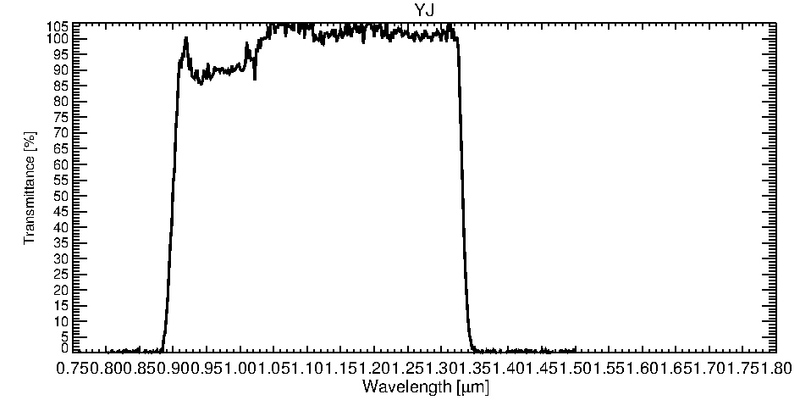 The data below was acquired with the 0.8 arcseconds long-slit CSU configuration and is representable for the middle line of the detector. The text file with the OH airglow lines identifications is available here. All the relevant information to prepare observations with EMIR can be found in the EMIR User Manual. We strongly recommend to potentially EMIR users to read that document for a complete description of the different observing strategies and currently available observing modes. EMIR observing overheads are really severe, mainly in imaging mode. For typical science exposures, open-shutter efficiency for EMIR is about 50% (including dithering, readout overheads, etc.). For this reason, in order to optimize the telescope time for a predefined on-source integration time, users should make use of the EMIR efficiency calculator available here. The PIs should select the appropriate telluric standards and prepare the corresponding OBs. Note that the telluric standards will be charged to your program. The time needed for those should be taken into account when preparing the proposal. Please indicate in the Phase II readme file which telluric standard OB corresponds to which science observation. From a scheduling point of view, the standard practice will be that the telluric standard will be observed after the science target and will be acquired with the ASG without opening the CSU to alleviate operational overheads. Keep this into account when selecting your standard stars. In case you need a different observing strategy, please justify it in your proposal. Observing the telluric after the science target is done in order to extend the CSU life by decreasing the number of re-configurations. Here you could find the IAC EMIR web page with some suggested telluric standards. 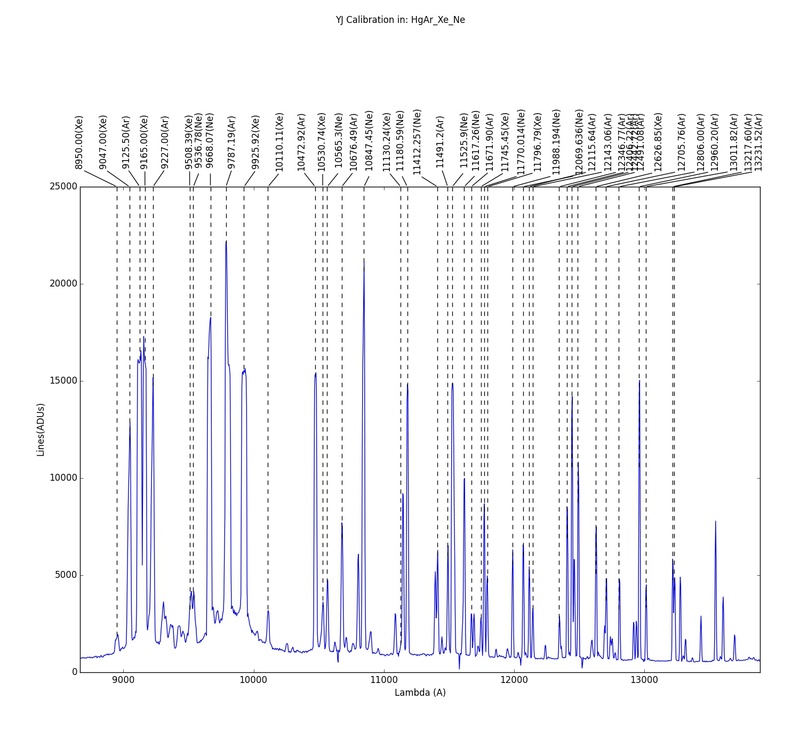 The Gemini Telluric Standards Selection Tool is another possibility to select the stars needed to correct your science data. 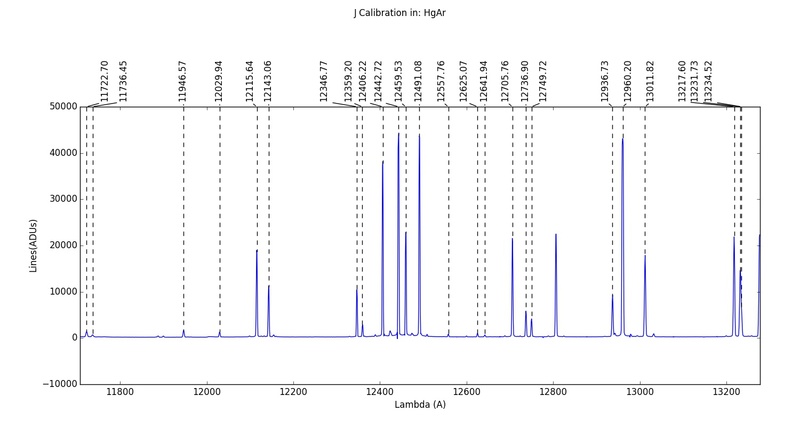 Some typical exposure times (for the individual ABBAs) are suggested in the table below for the different spectroscopic configurations as a function of the magnitude of the teluric star. 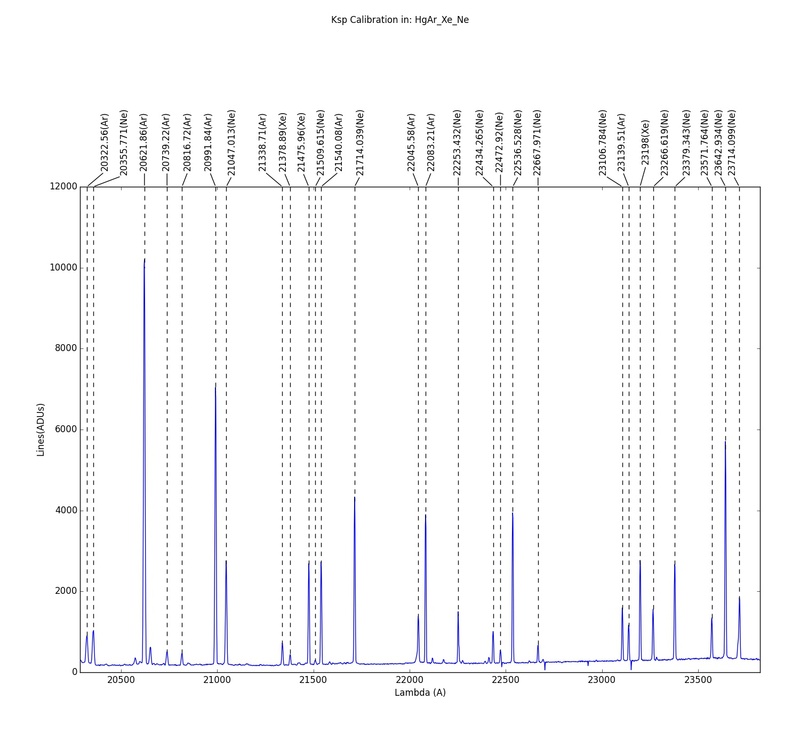 (The reference filter in the 2MASS system is listed in the second line of the table.) Note that this is still work in progress and the table below will be updated as more data comes in. For the time being, the values from the table should be treated with caution. 4m 2 sec. 2 sec. 10 sec. 2 sec. 2 sec. 5m 5 sec. 10 sec. 30 sec. 3 sec. 4 sec. 6m 10 sec. 10 sec. 60 sec. 5 sec. 10 sec. 7m 20 sec. 20 sec. 120 sec. 15 sec. 20 sec. 8m 60 sec. 60 sec. 320 sec. 30 sec. 60 sec. 9m 120 sec. 120 sec. 360 sec. 120 sec. 120 sec. 10m 360 sec. 360 sec. 360 sec. 360 sec. 360 sec. Selecting a brighter telluric standard assures that the required high SNR for the standard is achieved with minimal investment of observing time. 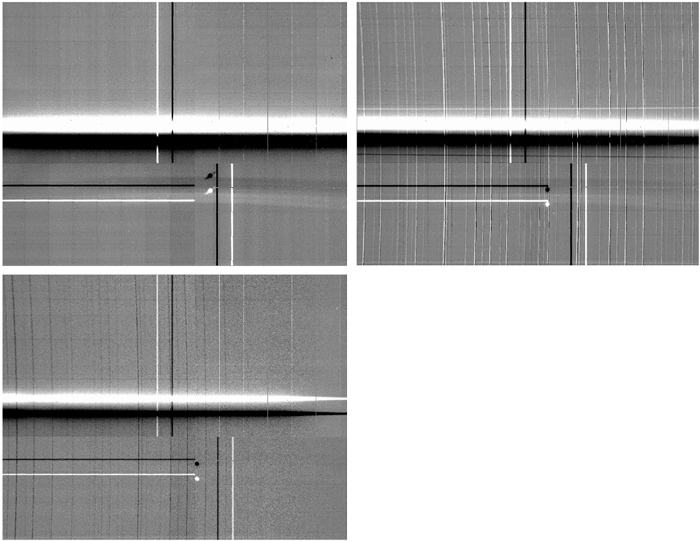 In the case of Multi-Object Spectroscopy observations with EMIR, each given slit covers a wavelength range that depends on the slit position. 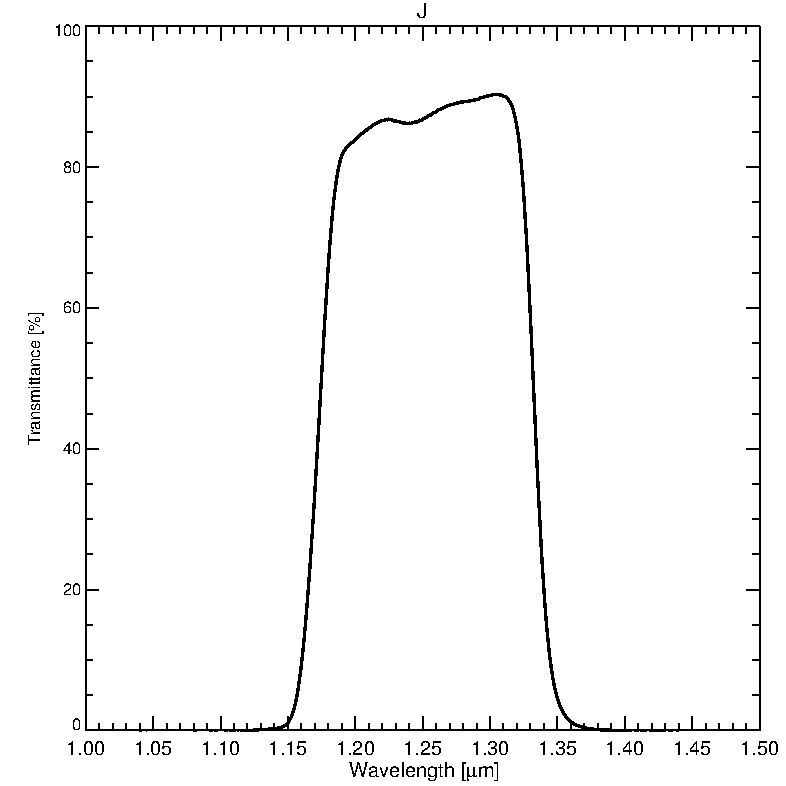 Hence, to take one single spectra of the standard with the slit placed at the center (like for longslit spectroscopy) will not cover the full wavelength range covered by a generic MOS configuration. In EMIR MOS mode three spectra of the standard will be obtained: one with the slit placed at the center of the field of view, another with the slit placed at the extreme left, and a third one with the slit at the extreme right. All in one frame. In this way it is guarantee the full wavelength range a MOS configuration might cover, it is covered. This mode uses a predefined MOS configuration (see next Figure), so no mask design with the OSP is required. However, the duration of the observation will be three times larger than the required in long slit observations. EMIR MOS Telluric configuration by using 5 arcsecs wide slits.